Please refer to our stock # 383 when inquiring. Her complete condition is good to age ..... bisque head is free of damage , chip o repair .... note a very hard to see old stable hairline at her shoulder plate at front ... please see my last picture and her original body is generally sturdy and clean ... note her a small color refresh at her hands and an small repair at one of her arms. It´s well done and complete covered by her pretty lace hand gloves . 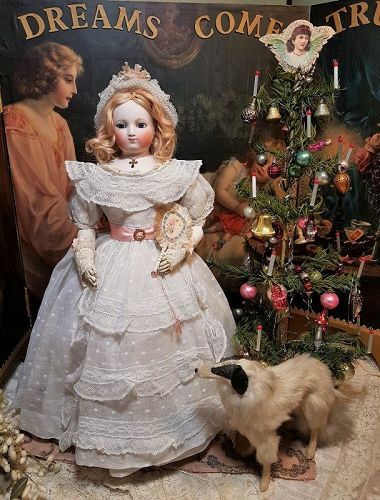 The early doll is beautiful wearing with rich set of under garment with stocking and very nice replaced heeled leather shoes , fine white muslin afternoon gown with longer train in back and bustle , lace gloves , pink silk sash and pretty netting bonnet. Made in France circa 1862 / 65 by F. Blampoix and mark by E.C. Barrois ........ Has very gentle facial expression and with her pretty clothing she is ready to display and enjoy ! !